Discussion in 'Audio Hardware' started by amgradmd, Dec 29, 2017. I was late to the party, but I’ve come around to the belief that a well designed analog rig generally sounds better to my ears than even the best digital setup. Specifically, there’s just something about vinyl that sits well with my ears. I know it’s an inferior source compared to digital in almost every way according to the specs and engineering, but it still sounds more “right” to me. Even now, I’m listening to Wayne Shorter playing “Dance Cadaverous” on the Blue Note reissue Speak No Evil and switching back and forth between the vinyl and the digital file played from Roon to the DS DAC and I just like the tone and pace of the vinyl, generally. Despite everything that is going against it. It’s not always better, but usually at least as good, depending on the mastering. 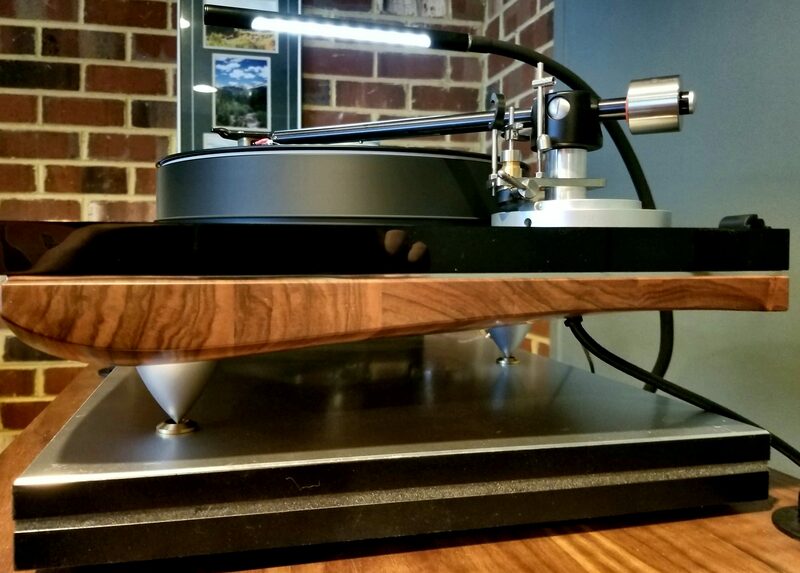 This leads me to the Gold Note Mediterraneo, a stunningly beautiful turntable made in Florence, Italy. This table has done nothing but reinforce my opinion of vinyl’s superiority at delivering music. And how. 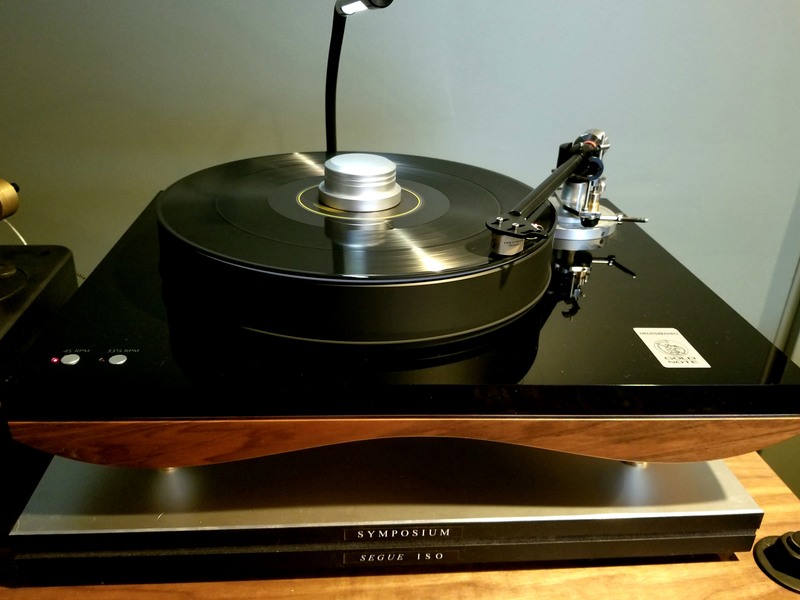 I first became aware of Gold Note several months back when I was looking for a new phono preamp that would play well with my Soundsmith Zephyr MIMC Star cartridge, a 0.4 mV moving iron cart that is pretty amazing. I tried to make it work with a Rogue Ares, but it just didn’t work for some reason so I returned it. So my search led me to the Gold Note PH-10 phono preamp which is a pretty amazing little unit in that it will work with pretty much any cart with ease and it’s upgradeable with a lineal power supply upcoming as well as a tube output stage. It also has the ability to change the standard RIAA curve to one with more treble energy or even the DECCA London or Columbia curves, with or without the treble boost. And it’s all analog. A very clever device. So I convinced my local dealer to become a dealer for Gold Note and finally got the PH-10, which I absolutely love. It’s a fantastic unit, especially for the price of around $1500. In getting the PH-10, I had established an email relationship with the CEO of Gold Note, Maurizio Aterini, who is made from the Paul McGowan mold in that he gets customer service and is absolutely passionate about his products. Anyway, I thanked Maurizio for the preamp and mentioned to him that maybe one day, I’d be lucky enough to get one of their stunningly beautiful turntables, the Mediterraneo. I left it at that since I already had a wonderful turntable in my Fern & Roby Montrose, and wasn’t in the market for a new one. Well fast forward several months, and I read an article about the Mediterraneo in positive-feedback.com about the Mediterraneo and how it, along with the PH-10 and the GN Donatello Gold cartridge, had won their “Brutus” award which is chosen by each of their writers at the end of the year. Anyway, right on the heels of reading that, I received an email from Mr. Aterini with an offer to buy the Mediterraneo and Donatello cart at less than half of the retail price. I can only assume he remembered my comment re: the Mediterraneo and decided to make me the offer! And it was the exact table that had been reviewed and awarded by PF.com. A famous turntable!! But like I said, I already had a nice TT. Why would I want another one? To which I answer, take a long look at the Mediterraneo and tell me you wouldn’t make irrational decisions! It’s absolutely stunning. (edit: plus @SHU also talked me into it!!) Plinth made of 600 year old Italian walnut. Solid acrylic top and beautifully tasteful tonearm. Side rant: one thing I absolutely hate about turntables is that they often look like contraptions – all function and no form. They often look like a hideous machine that is simultaneously designed to spin records but also leap off of the counter at any moment to attack you in the name of evil audiophilia. Or something of that sort. The point is that most turntable design leaves a lot to be desired, that’s for sure. So I agreed to purchase the table and wired Maurizio the money (which made me wonder if this was the most elaborate phishing scam of all time, seriously). I was relieved when I got an actual tracking number, that’s for sure. So after several days, it arrived and was in good shape. I’ve heard horror stories about shipping and audio equipment, especially turntables, so I was mighty worried! Anyway, my wife picked up the table from my local shop who was nice enough to accept the package. I didn’t know until too late that she had taken the table inside herself!! This table is 65+ pounds plus packaging. She may look like one, but she’s not a delicate flower! When I got home from work super late (of course), I inspected everything and all was good. I set it up pretty easily and had music going in less than 20 minutes with cartridge alignment, VTA, and VTF dialed in. Azimuth would wait another day. I couldn’t find the 0.9 mm allen wrench for the headshell! Oh well. It looked fairly close, but I’m a stickler for azimuth. So the next day I went to four (!) hardware stores looking for such a small allen wrench. Finally I found one in an all-in-one 41 piece electronics kit for $35. Figures. $35 for a 10 cent allen key. But at least now I can adjust the azimuth like a civilized gentleman should. Well how does the Mediterraneo sound? Several words come to mind, detailed, lively, solid, silent, neutral, dynamic. In short, it sounds exactly how I had hoped. The shielding and grounding on this table is superb with very little hiss with the tonearm up. Significantly less than with the F&R, and that was already very good. Once I drop the needle, and I am awestruck at how the Mediterraneo/PH-10 combo has almost no surface noise, whatsoever. It makes me imagine that there is some silicon coating on the vinyl to allow such a silent march across it’s lead-in groove. And several of us on this forum know from owning the PS Audio Directstream DAC, a quiet background is incredibly important in reproducing a recording realistically. When the music kicks in, the bass is so realistic and accurate, it’s amazing. Another thing becomes self evident in that the midrange is unbelievable realistic and smooth. Voices, guitars, and horns all sound amazing. Great treble an detail and huge soundstage are similar to my Montrose, which are it’s strengths. Speed tested at 33.34 RPM, not bad! There is no discernible pitch variability, either. It sounds rock solid. I must say I’m incredibly impressed by the Donatello Gold cart. I tested the cart with my Feickert Adjust+ disc and got matching channel separation of 40 dB, which is an amazing number. Most $5k plus carts can’t match that. Plus, the frequency response is near ruler flat and within 3 dB difference from 20-20,000 Hz with a slight bass tilt. It sounds every bit as good as my Soundsmith cart, which is saying something. And finally, it is just so drop dead gorgeous, it’s crazy. It comes with a very nicely engineered dust cover, but I don’t want to put it on. It would be like putting a jacket on the statue of David. Why do that?? Anyway, I’ve said enough about my Christmas present. Now on to some pictures! Please note these were taken before I had really cleaned and polished it and were taken with a phone camera! Dan Steele, FLEMKE, Art K and 11 others like this. By the way: you know that you can finetune the platter speed, right? Already done! So simple I love it. It ran initially at 33.50 but had to choose between 33.32 and 33.34. I went for a touch fast. How do those pianos sound now? Living up to your expectations? I have a guy coming to my house to do cartridge and arm alignment on my Mediterraneo tomorrow. Piano sounds rock solid. No wavering at all on sustained notes, which drives me crazy. It's as good as I was hoping! And the bass. Dayum! I wasn't prepared for that. Let us know how the alignment goes! Wow, that is absolutely gorgeous! Thanks for the pics and review. That’s a beautiful turntable. Thanks for sharing your experience with us. Beware Italians making you offers you can't refuse, hey! Very nice, congratulations. I would be interested in more in-depth comparisons with the Montrose if/when you get a chance. I would have to say, without having switched the Soundsmith MIMC Star cart onto the Mediterraneo, that the two decks are more similar than different in terms of overall sound. I've highlighted the main differences above, namely the blacker background of the Mediterraneo both with the needle up and on dead wax. Quiet passages therefore are a slightly more crisp on the Italian table. I think there is faintly increased rumble also on the Montrose, but that is getting nitpicky considering the price difference of almost $3k. I do think there is more speed stability on the Mediterraneo than the Montrose by a smidge, without having measured it. My Feickert speed disc is pretty inaccurate, I've found, so I don't heed it much. Both are very accurate on speed with the Montrose at 33.33 and the Mediterraneo at 33.34 RPM. Both come from a high mass school of thought and therefore have a solidity to the bass and very lively and detailed presentations. I do think there is a slightly more solid bass foundation on the Mediterraneo, likely due to it's greater mass of plinth and platter or 55 lbs vs 37 lbs, or thereabouts. The biggest difference is between the aesthetics, honestly, with the Mediterraneo having clearly a more elegant, high end type styling with the walnut plinth. Still, the more industrial Montrose is without a doubt striking in a different, more industrial and manly way. They are two of the most distinct, and well engineered, tables I have come across. I think they are equally excellent performers, given their price points, honestly. A little long term follow up on the Mediterraneo. One thing that concerned me a little when I got the table was the slightly increased level of wow & flutter I measured with the Feickert Adjust+ disc and PC software. I was routinely getting numbers of up to 0.17-0.18%. Could I hear a little warble in piano notes? Perhaps a touch, but I am very attuned to hearing that. Keep in mind that I got this table as a mild to moderately work review unit, so it had been played somewhat and shipped from Italy to California and back to Virginia. For things to be off a little are not surprising. 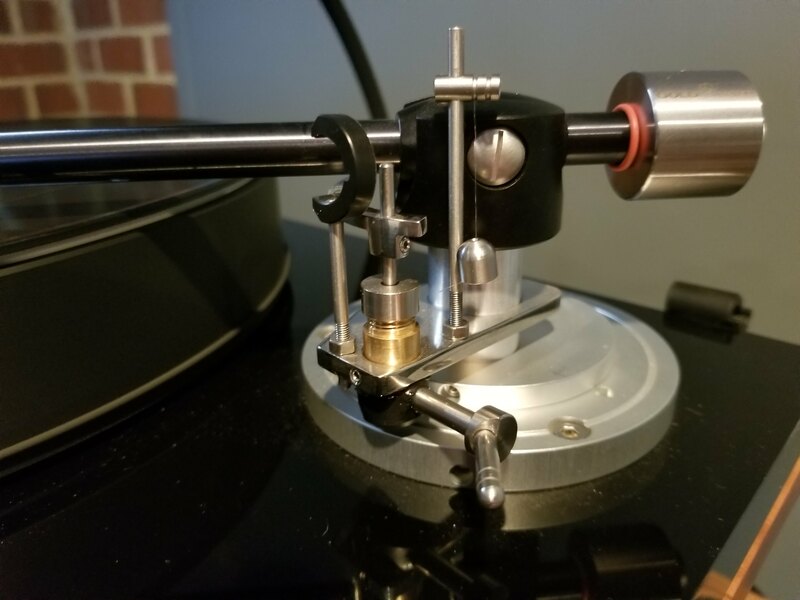 Well after talking to Maurizio Aterini of Gold Note, he recommended cleaning and re-lubricating and greasing the spindle and bearing assembly and he also shipped me a new turntable belt made of a different compound to reduce possible speed inconsistencies. So I did as Maurizio instructed and re-lubed and greased the spindle and bearing and replaced the belt. Then I left the table running nonstop for 48 hours to break it in. After doing so, I noticed an immediate improvement in the sustained piano notes and solidity to the drive of the music. I tested the W&F and, as I suspected, got a measurement of 0.06%! This is better than the spec of 0.1%. So this makes me very happy as I am a big fan of piano jazz and I no longer have any issue whatsoever with pitch instability. Love this table!!!! nosliw, Shiver, SHU and 3 others like this. Ace. What lube/grease exactly did you use? I used Mobil Synthetic 0W20 per recommendation and a high quality lithium grease that I can't remember off of the top of my head. Also, which alignment tool did you use for it? I gather all new Gold Note tables come with their Baerwald-based protractor (mine was used and didn't) - did you use that and/or something else to best effect? It comes with one but I didn't use it. I use the Stevenson PDF download from Vinyl Engine and it seems to work well. The Gold note one I tried to use, but the plastic was a little curled up making it difficult to use. I found that using this protractor the cart didn't have enough overhang when I got the table and I checked this with another protractor to make sure. Apparently the cart had been fiddled with and given incorrect overhang from one of the reviewers. Just saw this on M. Fremer's Munich show video and thought it looked really nice. Is it easy to adjust VTA and VTF on this table? I wonder if it can be bought anywhere in the US.....I will check that. Beautiful table. I myself bought the Gold Note Valore 425 Plus a year ago and simply love it. I upgraded the phono cable and wow, it really added to the sound of the table. I noticed that you were dealing directly with the guys in Italy and that is why I bought my table. in Italy got in touch with the distributor here in Canada and it was taken care of! The VTA on the Mediterraneo is easily adjusted with a single screw and an allen wrench. One thing I have adopted that I learned on this forum is to measure the height of the tonearm with respect to the table with playing cards. I measured the optimal VTA be ear and it was set with 20 playing cards under the flat plate over the tonearm base. I tested at 5 card increments from 5-50 and the sweet spot was between 15-25 and 20 the best. That was with the GN Donatello Gold MC cart. If you really want to get granular, you can adjust one card at a time, but I found it very hard to tell differences in one card. As for the VTF, it is easily adjusted with counterweights with allen screws like so many other tables. Plus it has a little rubber stopper to mark your position if you want to change it. Audio Exchange in Richmond can get you anything Gold Note. 804-282-0438. Ask for Donny. How about motor noise? I tried one and the motor pulley made way to much noise for me. Pulley wobble too.